Jay Donnelly, pictured here in action against Ballymena United's Johnny Taylor earlier this season, is one of three Cliftonville players to receive international cal-ups, leading to this Saturday's game at the Showgrounds being postponed. 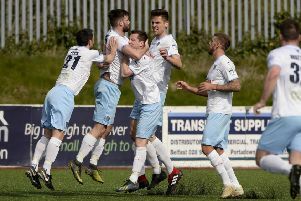 Ballymena United’s Danske Bank Premiership home game against Cliftonville scheduled for this Saturday, has been called off. The Belfast side have three players called up for international duty at under-age levels and have exercised their right to request a postponement under Northern Ireland Football League (NIFL) rules. Jay Donnelly is in the under-21 squad for the European Championship qualifier in Scotland, while Levi Ives and Andrew Morrow are in Holland with the Northern Ireland under-19 squad. NIFL are expected to announce a new date for the match shortly.